Lost and Found presents work by four artists who engage with process and materiality and play with ideas around the recovery and representation of memories, objects and species. ELIZABETH GRANT (Ngati Raukawa and Ngati Huri) draws on her background as a biological illustrator to create finely detailed bronze sculptures of native flora and fauna which explore the intersection of nature and culture. She is particularly interested in art's engagement with ecology and the tension between extinction and preservation in ever-changing ecosystems. Critic Mark Amery described her response to the painted native pot plants of the 19th century East Coast marae, (shown in the galley last year) as "outstanding." He went onto say that her work "provides a strong movement forward from both Maori tradition and the work of Paul Dibble." Grant is currently working on a PhD in Maori Visual Arts at Massey University. BRONWYN HOLLOWAY-SMITH is interested in new technologies and the futuristic ideals and challenges that these technologies may bring. She often draws from, builds upon, and creates connections with the past as a means of envisioning the future and imagining the fantastic. She works in a diverse and interdisciplinary manner and her most recent work, seen in this exhibition, has utilised 3-dimensional printing technology to replicate objects "imagined as lost, hidden or misregistered" from the Museum of New Zealand.. Holloway-Smith has shown at several public and artist-run galleries and has works represented in public and private art collections including the Wallace, the Wellington City Council, and the Massey University Collection. She holds a Bachelor of Fine Arts from Massey University and lives and works in Wellington. ROBYN IRWIN effectively paints in glass and it is this painterliness, unusual in the glass medium, that makes her work so distinct and gives it a conceptual depth beyond form. She uses the lost wax method of casting and eschewing the conventional translucency of her medium and employs opaque glass to suggest forms inspired by landscapes. Irwin's work is in private collections in New Zealand, Australia and the United States and in the collections of Elton John, Te Papa Tongarewa - the Museum of New Zealand and the Ebeltoft Glass Museum in Denmark. LISA WALKER is a jeweller/artist whose work investigates the role, form and possibilities of jewellery. Frequently using found materials, she is interested in finding an aesthetic which is rarely seen but which at the same time, because of its references to jewellery traditions, is familiar and recognisable. Born and raised in Wellington, Walker returned to the capital in 2009 after 15 years living in Germany. 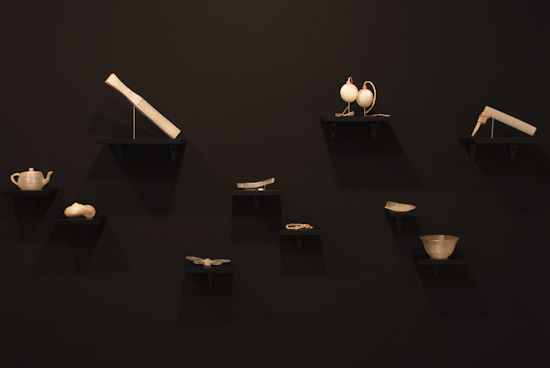 Described as "one of New Zealand's most internationally successful jewellers" Walker has exhibited widely in Europe and in the US, Japan, Australia and New Zealand with a survey shown in Melbourne and at the New` Dowse. In 2010 she won the prestigious European Françoise van den Bosch Award and this has led to exhibitions later this year in New York, London, Amsterdam and Christchurch.